Last weekend we had the opportunity to visit Chinato, a restaurant in the E. 4th district downtown. No, it’s not Chinese, it’s actually named for an Italian after-dinner wine. And it’s pronounced with a “key,” not a “chi.” I didn’t know that either. 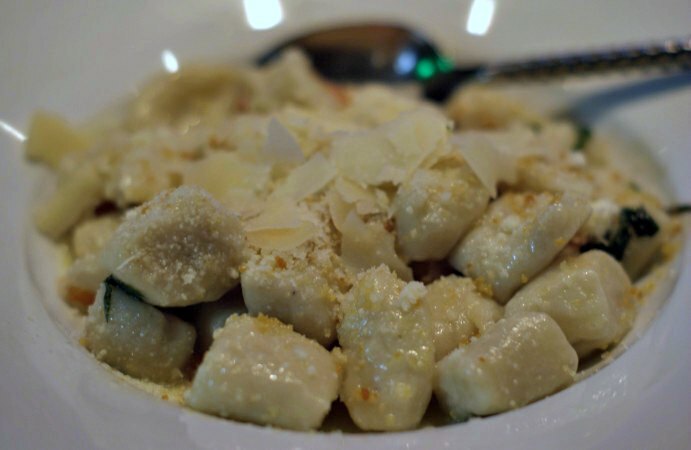 Chinato’s menu is Zack Bruell’s interpretation of simple, authentic Italian cuisine. The menu is quite extensive (lots of homemade pastas, pizzas, seafood and meats, including some that we don’t see often, like tongue, liver and sweetbread), and it took us a bit of time to make a decision. The ambience is fairly typical – dim lighting, dark colors, not too noisy (though it did get a little loud at the bar from time to time). Nice and cozy on a blustery January night. We did not have reservations (short story) and they were full when we arrived, so we ended up eating at the bar. Not a problem for us, but if you have a larger party, I’d guess reservations would be recommended. It may have taken us a while to find something to eat, but we eventually did. 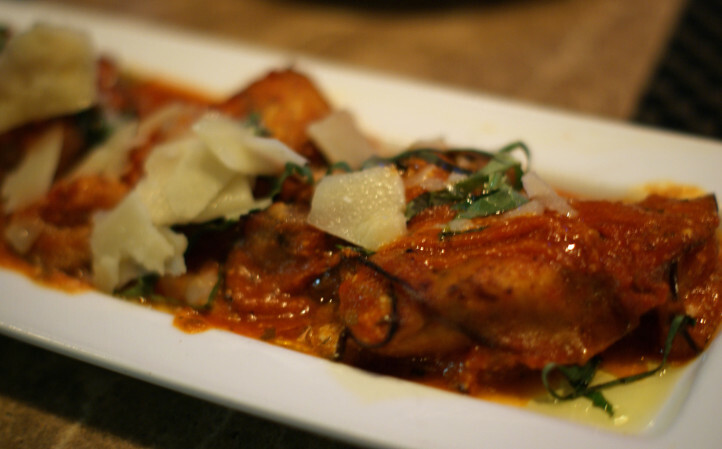 We started with an eggplant involtini (very thin strips of eggplant rolled around a filling) stuffed with ricotta and shrimp, and topped with a nice red sauce that had a hint of baking spices. Very flavorful with good texture. 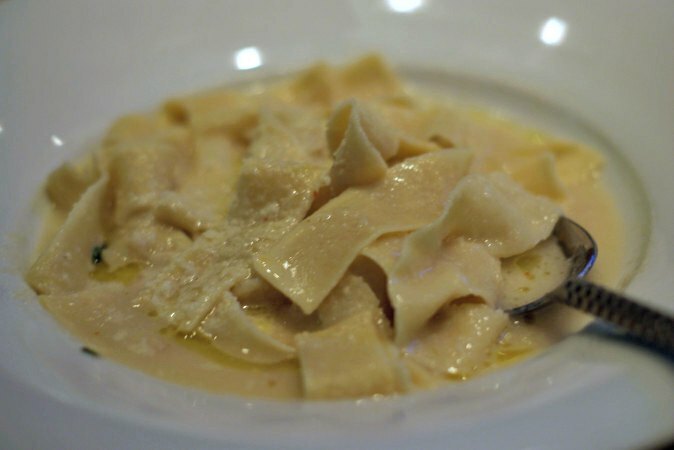 For our dinners, S eventually chose a pappardelle with creamed cauliflower, pecorino cheese, and peperoncini. Simple preparation and presentation, but quite delicious. The pasta had the look of being topped with a heavy cream sauce, but was deceptively light because much of the “cream” was pureed cauliflower. It also had just the right amount of saltiness from the cheese to bring out the other flavors. After careful deliberation, I also went with something on the rustic side, and had a nice gnocchi with butter, parmesan, tomato, basil, and garlic, and sprinkled with some kind of toasted breadcrumb. It was not overly heavy, as gnocchi can be (though I was still pretty stuffed when I finished), and the slight crunch of the topping added some pleasant texture. Again, fairly simple but very satisfying. And finally, the highlight of the evening: lemon polenta cake. 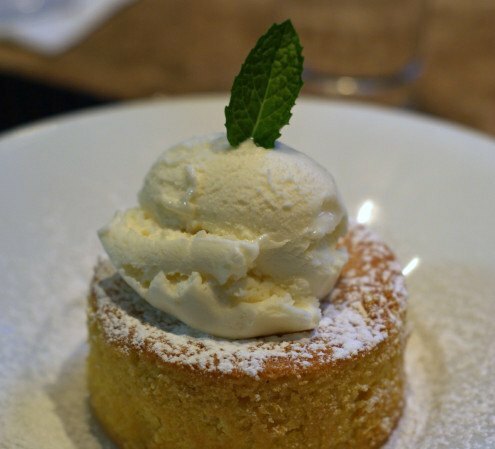 Kind of like a lemony, sweet, extra-moist cornbread, dusted with powdered sugar and topped with a scoop of lemon gelato. Sweet and crumbly and refreshing, all in one. Final verdict: Chinato earns somewhere between a 5 1/2 and a 6 out of seven stars; I don’t like picking round numbers all the time. The food was excellent (and would warrant a return trip to try some of the other unique offerings), prices were reasonable (most dinners were under $20, with a few in the low- to mid-$20s), and our server, Annie, who also doubled as the bartender, was very helpful (and patient). Aside from the fact that we had to walk back out into the cold wind when we were finished, it was a most enjoyable dining experience.